Now synonymous with the popularity of movie-related toys, not to mention secondary market collecting, the original Star Wars line had a very low-key beginning. Contracted to produce a modest selection of toys, the success of Star Wars took manufacturers Kenner completely by surprise and left them unable to produce a range of action figures in time for Christmas 1977. In a risky move, they sold what was effectively an empty box – the ‘early bird’ set containing a certificate that could be redeemed for four figures – in the hope that the buzz created by the film would last into 1978. Of course, the gamble paid off and Kenner went on to produce nearly 100 figures and dozens of vehicles and playsets over the following seven years. Early figures were rather hit and miss, with characters such as Darth Vader having cheap vinyl capes, rubbery legs and heads that had a tendency to snap off. However the ongoing popularity of the movies allowed the figures to be improved with later offerings like Yoda and ‘Jedi’ Luke being of particularly high quality. 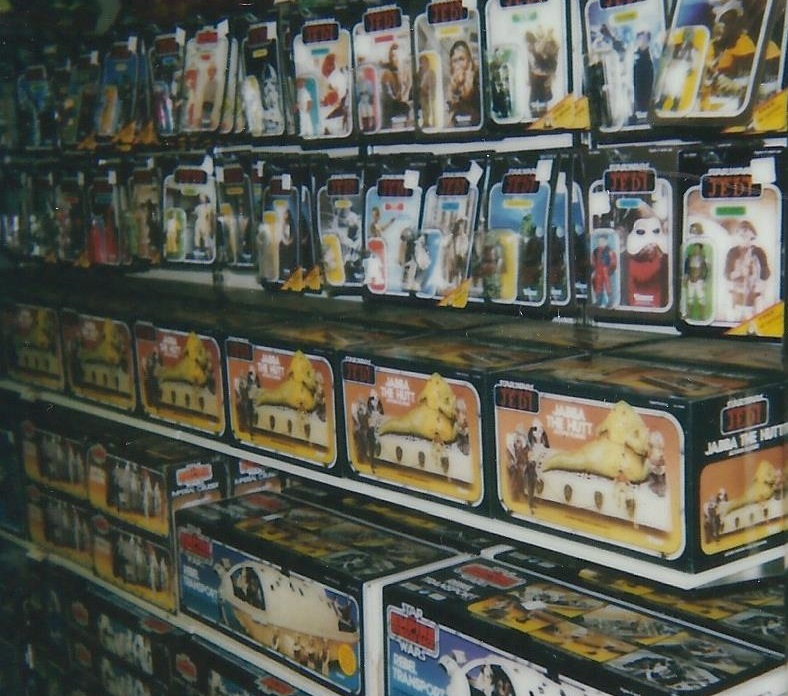 Kenner’s range popularised the 3 ¾” sized figure and revolutionised the licensed toy industry, and almost 40 years on new Star Wars toys continue to sell by the bucket-load to kids and collectors alike. Having already produced a successful line of action figures based on DC and Marvel superheroes, in 1974 Mego released the first figures to be licensed from a Sci-Fi film. Despite arriving six years after the original movie release, the range was very popular as it tied in with the TV premieres of the first two Apes films. The initial range included five figures, and notably the ‘Astronaut’ figure bore no resemblance to the movie’s star Charlton Heston because Mego did not want to pay to use his likeness. 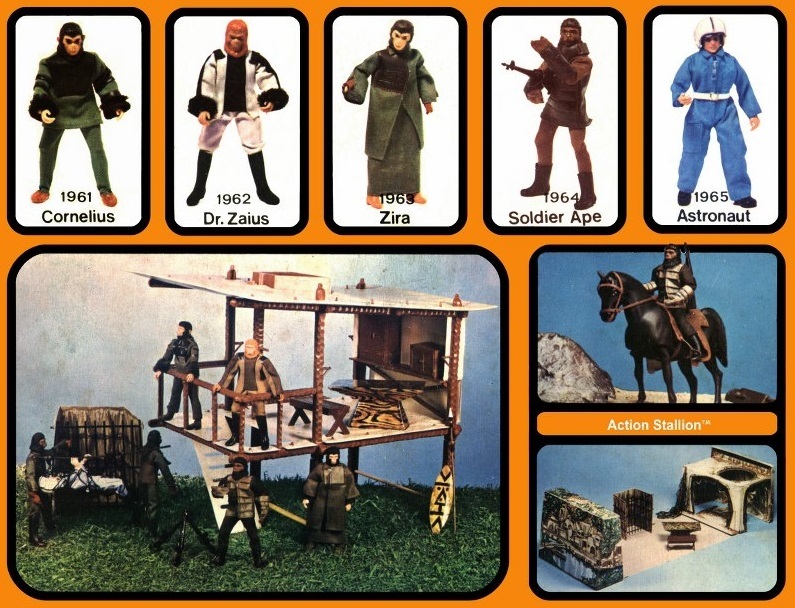 A second wave of figures was released to coincide with the short-lived TV series and the toys featured in top ten lists for 1974 and 1975. Buoyed by this success, Mego licensed a variety of other Sci-Fi franchises but rejected the chance to create toys based on Star Wars, an error that ultimately contributed to their demise in the early 80’s. 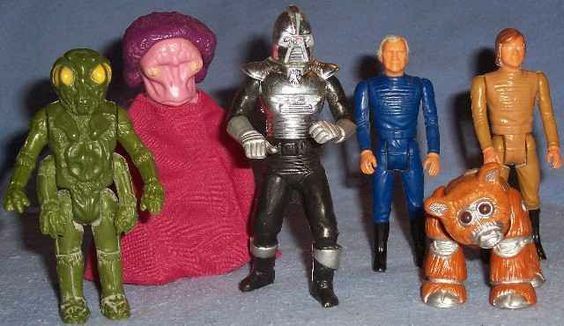 Following the success of Star Wars, every Sci-Fi franchise needed an associated toy range, and Battlestar Galactica was no exception. Mattel launched the line in 1978 with a selection of vehicles piloted by 2” figures and able to launch red plastic missiles. Tragedy struck when a young boy choked on one of these, so the range was quickly recalled and re-issued with non-firing missiles. 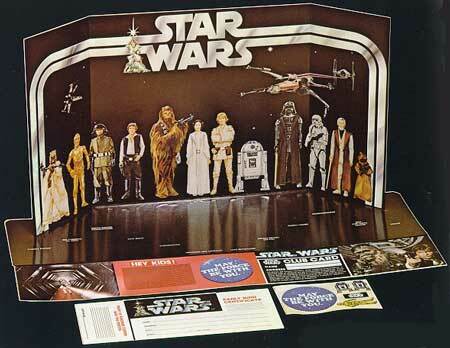 Action figures followed in 1979 but rather like the TV show, the toys lacked the quality of the Star Wars line. The human figures were not very detailed, while aliens such as the purple-afroed Imperious Leader were rather unappealing. The exception was the Cylon Centurion, which was also produced in an impressive 12” version with movable red eye. 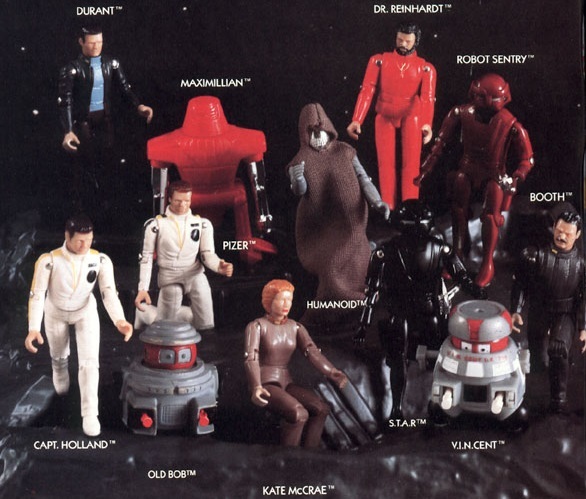 Inspired by the 1979 Disney movie, Black Hole action figures were one of many examples of Mego backing the wrong horse. The film wasn’t that bad but failed to capture the imagination of the movie-going public, and consequently sales of the toys suffered. The series consisted of 12” figures based on the human characters and a more extensive range of then-obligatory 3 ¾” figures compatible with the Star Wars line. These were very well sculpted, particularly the robots Maximillian, Old B.O.B. and V.I.N.Cent, all of which are now very desirable to collectors. Mego’s range of Black Hole figures looked great but didn’t sell well. There’s more Sci-Fi toys on Page 2. Can you guess Who?